Despite Bhutan’ small population, there has been much economic development in recent years and the economy is growing rapidly. While a large part of the Bhutanese population is still illiterate and reside in rural areas with approximately 1 in 5 still living under the poverty line, the majority of all Bhutanese have shelter and are self-sufficient. Rapid modernization has brought about vast improvements in the living standard of the Bhutanese people. All villages now have access to basic amenities such as education, running water, basic healthcare and are connected by roads and electricity. Even the most remote villages have a connection to the telecommunication network including mobile phone service. The Bhutanese economy is predominantly agricultural. Farmers supplement their income through the sale of animal products such as cheese, butter, and milk. Farmers’ markets are common throughout the country, supplying the people with fresh, organic, local produce. The main staple crops are rice, maize, wheat, and buckwheat while cash crops are predominantly potatoes, apples, oranges, cardamom, ginger, and chilies. A fruit-based industry has been established in the capital allowing farmers from the nearby areas to sell their products and thereby earn additional revenue. Bhutan’s rich biodiversity provides the country with ample forest resources and this has brought about the development of a thriving cane and bamboo handicraft industry. Craftsmen weave a number of beautiful and intricate items out of bamboo and cane including hats, backpacks, floor mats, and traditional bowls. These items are then sold to tourists or Bhutanese, supplying a secondary income source. The government is committed to building a sustainable tourism industry that is not only financially viable but also limits the negative cultural and environmental impacts commonly associated with the culture of mass tourism. By establishing a policy of “High Value, Low Impact’ tourism, the kingdom of Bhutan seeks to ensure that it attracts only the most discerning visitors with a deep respect for cultural values, traditions, and the natural environment. To this end, efforts have been made to ensure that even remote areas are publicized and able to reap the benefits of tourism while still respecting their traditions, culture and natural environment. The Manufacturing sector is another major contributor to national revenue. With the industrial sector established in Pasakha, small scale industries such as cement plants, calcium and carbide, steel and Ferro silicon, Coca Cola and also wood-based industries have started developing. 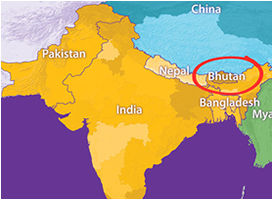 As a result of the recent economic development, Bhutan has one of the highest per capita incomes in South Asia at US$1,321. However, despite this high level of growth and development, efforts stringent retaliations have been enacted in order to protect Bhutan’s natural environment.